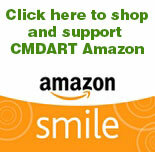 CMDART is an independent, charitable, non-profit, tax-exempt 501(c)3 organization. We provide information, training, support, supplies and personnel to help plan, prepare and respond to aid animals affected by man-made or natural disasters at all levels of disasters according to our capabilities and resources. We are updating our site, please check back for updated information soon! “CMDART recently held a Greet, Reach, Teach gathering to provide an opportunity for our volunteers to gather together, enjoy meeting, and learn some new skills together. Our special guests were from the Humane Society of the United States talking about our year-long deployment of volunteers to aid emergency animal sheltering for the Great Dane incident in New Hampshire. 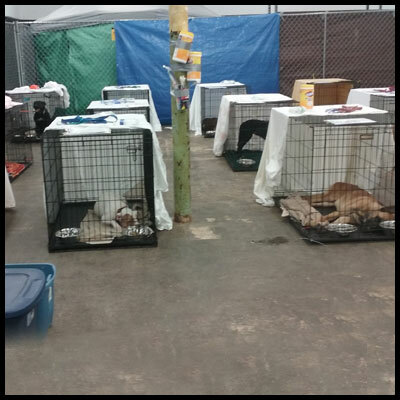 more than 500 volunteers from cross the country, including 12 from our team, deployed to aid the massive task of doing emergency animal sheltering for 84 Great Danes who eventually were re-homed. The second Greet, Reach Teach, included guest speakers Michael Keiley, from the MSPCA, speaking on their response to the Merrimack Valley Gas Explosion. CMDART had readied volunteers and equipment for mutual aid, but eventually only supplied goods to some of the shelters set up in that area. 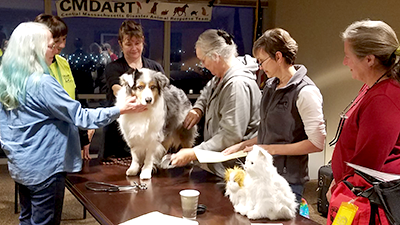 Ilene Segal, DVM, from SMART, also joined us at G,R.T, to help us review some basic vital signs and pet first aid we would do at an emergency situation/shelter. We were glad to have a couple of animal control, members of the local CERT teams, and Medical Reserve Corps attend the events held at the American Red Cross building in Worcester. Congress is poised to make a big step for animals in times of disasters and emergencies. The Providing Responsible Emergency Plans for Animals at Risk of Emerging Disasters (PREPARED) Act, H.R. 1042, will mandate that facilities regulated by the Animal Welfare Act, such as puppy mills, research facilities, zoos and other businesses need to be prepared for disasters. 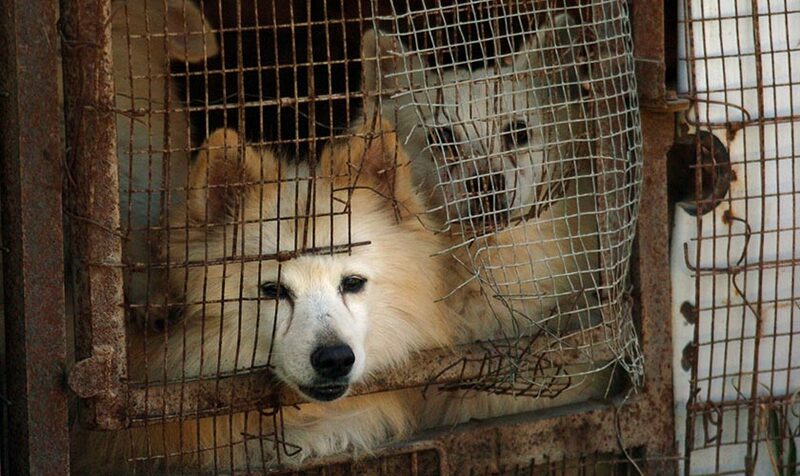 Please urge your U.S. Representative to cosponsor the PREPARED Act today. Currently, enterprises covered by the Animal Welfare Act aren’t required to have disaster plans for the animals under their care. The PREPARED Act will fix this by requiring those facilities to submit annual disaster preparedness plans to the U.S. Department of Agriculture and outline specific instructions for various emergency situations. 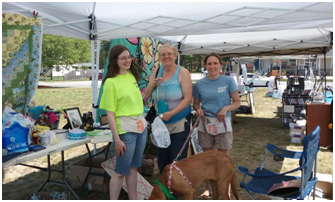 The eighth annual Tags for Tails Fund-raiser for CMDART will be held June 15, 2019, 7-5 pm. Donations of QUALITY goods will be accepted beginning April 15 this year. See the attached flyer for specifics on what we accept and our guidelines (or wishes) for items. We need to ask that contributors make some effort to price your own goods to help us streamline our efforts. We are asking for helpers to transport items from private donors in the Blackstone Valley area, to help price items a few days prior to the event, and to help set up and break down the day of the event. We postpone for severe rain only. Severe rain day will be June 22. See more on the attached flyer including where to contact us. Please also note, this year, some remaining items left over after the sale will be offered first to volunteers and then to others who give at least one hour of volunteer time at the end of the event day. See attached flyer for more information and visit our donations page for all the details. See our donate and sponsors pages for more info about how we maintain our mission.